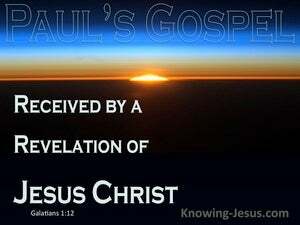 ﻿ Galatians 1:12 For I neither received it from man, nor was I taught it, but I received it through a revelation of Jesus Christ. For I did not receive it from a man, nor was I taught it, but it was revealed to me by Jesus the Messiah. For I neither received it from man, nor was I taught it, but it was through revelation of Jesus Christ. For indeed I did not receive it from man, nor was I taught it, but [it came to me] through a [direct] revelation [given] by Jesus Christ (the Messiah). [Furthermore], I did not receive this [Gospel message] from any person, nor was I taught it [by anyone]. Instead, it came to me through [a divine] revelation from Jesus Christ. for neither did I receive it from man, nor was it taught me, but by the revelation of Jesus Christ. For I did not get it from man, and I was not given teaching in it, but it came to me through revelation of Jesus Christ. For I did not receive it from man, nor was I taught it, but I received it through a revelation of Jesus Christ. for I neither received it from man, nor was I taught it but by the revelation of Jesus Christ. For neither did I receive them from man, neither was I taught them, but by revelation of Jesus Christ. for I did not receive it from man, neither was I taught it, but through the revelation of Jesus Christ. I did not receive it from any man, and I was not taught it, but it came to me through a revelation of Jesus Christ. For neither did I receive it from man, neither was I taught it, but by the revelation of Jesus Christ. For I did not receive it nor learn it from man, but by the revelation of Jesus Christ. For I neither received it from man, neither was I taught, but by the revelation of Jesus Christ. For neither did I receive it from man, nor was I taught [it], but [I received it] through a revelation of Jesus Christ. For I did not receive it from man, nor was I taught it except by a revelation of Jesus Christ. neither received I it of man, neither was I taught it: but received it by the revelation of Jesus Christ. no man put it into my hands, no man taught me what it meant, I had it by a revelation of Jesus Christ. for neither did I myself receive it from man, nor by man was I taught it, but by a revelation an apocalypse of Jesus Christ. For I did not receive it or learn it from any human source; instead I received it by a revelation of Jesus Christ. for I did not receive it from man nor was I taught it by any man, but it was revealed to me by Jesus Christ. for I neither received it from man nor was I taught it, but by a revelation of Jesus Christ. For neither, from man, did I accept it, nor was taught it , - but through a revealing of Jesus Christ. For I neither received it from man, nor was taught, but by immediate revelation from Jesus Christ. I, at least, did not receive it from man, nor was I taught it, but it came to me through a revelation made by Jesus Christ. For I neither received it from man, neither was I taught it, but by the revelation of Jesus Christ. 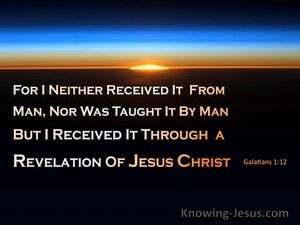 For, in fact, it was not from man that I received or learnt it, but by a revelation from Jesus Christ. for I did not get it from any man; I was not taught it, but I got it through a revelation given by Jesus Christ. for neither did I receive it from man, nor was I taught it, but I received it through revelation of Jesus Christ. For I neither received it, nor was taught it by man, but by the revelation of Jesus Christ.